If you want to do food allergy testing, the best and most economical place to have it done is through Alletess. Their web site is www.foodallergy.com. They charge about $130 to check for 96 different food allergies, both IGG and IGE, which is what you want, and you can still bill it to your insurance. (IGG will tell you food sensitivities which is what most people have, and IGE tells you true food allergies. If your child has an IGE allergy, that is probably an allergy that will stay with them. IGG’s can change over time. If you remove the food for a long time (minimum 6 months to a year), your child may be able to tolerate that food in small infrequent amounts. Some people refer to this as a rotation diet. After removing for several months, you reintroduce it to test, and if OK, the child only eats the food once every four days. The exception are peanuts, which your doctor may tell you to avoid indefinitely). 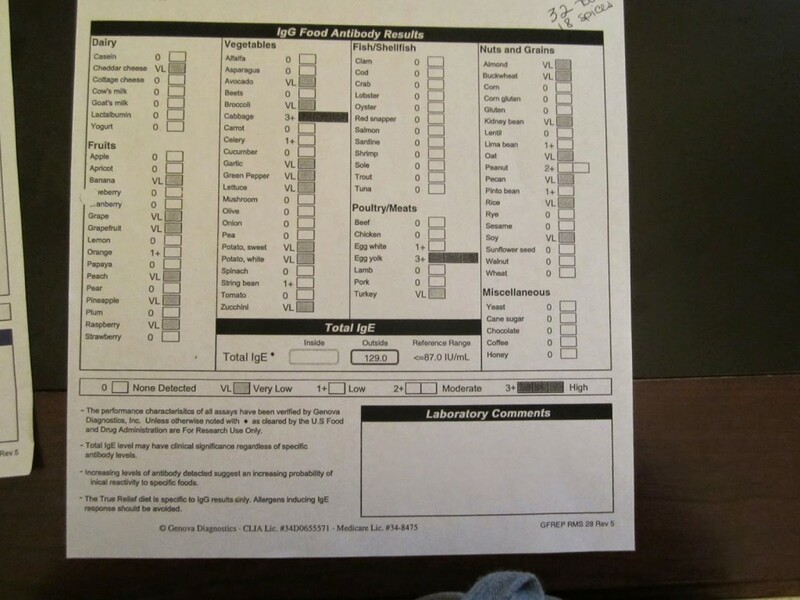 For our first food allergy testing, we went through our DAN dr. using Genova Diagnostics. They charged our insurance about $1,300 (this is common). Big difference! Same testing as Alletess. We only had to pay 10% of the cost because of our insurance plan, so we ended up paying close to $130 out of pocket. We also had to meet our deductible first, which we already had, but if we hadn’t, we would’ve paid much more out of pocket. I used Alletess to do food allergy testing on myself and many people on the gfcf diet board have used them happily. You go on their web site and order the kit. If you’re not sure which one to order, just call them and ask. They mail it out to you for free. It contains some blood viles and a box and instructions. Fill out the forms, then fax it to your doctor for him to sign off on it. (You need a doctor’s signature to get this testing done.) They will also mail the results to your doctor, and then when they get them, they send them to you. Next, take the box to your local hospital. We tried to go to Quest, but they wouldn’t take kids and they said they wouldn’t take kits. So, we went to Delnor Hospital. Call your local hospital and read the instructions in your kit carefully. I think in one of our kits, we didn’t need all of the viles they sent so make sure you take them out, or the hospital will use them. Ours has a special outpatient office that is specifically for drawing blood. We mailed the draws in ourselves. You have to wait about a half hour or so for the blood to be spun and prepared by the hospital once they take it, then they will put it in the box per the instructions. Tell them you will come back in an hour or whatever to pick it up. You should have called the pick up service before you go, to have a time arranged for them to pick the box up that day at your house. (All of this information will be in the instructions of your kit). You have to do draws from Monday through Wednesday or Thursday I believe so it can get to the lab before the weekend. Check to see if you need to fast for this test. I don’t remember. We had other blood work being done at the same time that they needed to fast for (not eat anything for 8 hours prior to the draw – so first thing in the morning). It’s a good idea by the way, to have any other testing done at the same time so that you don’t have to take your kids back for another blood draw. By the way, don’t be surprised if your hospital messes something up with the bloodwork. They are notorious for doing this. Kind of scary when you think about all that they are responsible for and they can rarely get blood tests done correctly. All of our food allergy tests were done correctly, but every time, they have forgotten to do one of the other tests, or they made a mistake like not freezing the blood before transporting to the lab, etc. We’ve had mistakes on tests for dopamin, serotonin, and copper. Everyone in biomed seems to know that this is commonplace sadly. You will have a fee from the hospital for drawing the blood for food allergy testing. I’m not sure how much that is because we also always have had other tests being done, so we would get a bill for the lab work and the draw. You can call your hospital and ask. Insurance should cover it. Ours did. We got a bill for $2,500 the first set of tests. I thought for sure it was wrong, but it wasn’t. Our insurance lowered it to around $1,800, so we ended up paying $180 out of pocket for our lab testing. (We had a lot done.) This was not just for food allergy testing. We have tested for many things that I don’t even remember off the top of my head. If you are nervous about having your children’s blood drawn, you’re not alone. I’m afraid of needles so I had my husband go with to be in the room with them the first time. It took me 3 months before I finally took my kids in for testing. For my 8 year old, I told him I’d buy him a new video game and he was excited about that prospect. My 5 year old daughter didn’t even whince. I think she has some kind of strange pain tolerance. She has never been vaccinated so didn’t know what a needle would feel like. My little guy (2) obviously didn’t like it so much. But, I had to remind myself of all the needles and testing they did on him when he had a seizure and I didn’t want to go through that again. If doing an allergy test is going to tell us important information that could prevent further seizures or issues that could lead to worse conditions where he would be subject to lots of blood draws and needles, this is a minor thing. Turns out my intuitions were right. He had food allergies and when we pulled the allergic foods (and gluten), his seizures stopped. He does still have minor seizures as he is falling asleep when he has eggs or gluten, but now I know why and we obviously don’t feed him these foods. (We’d been trying to test small amounts of these foods, and he still reacts to them with mini seizures). So how do you know if you should test your child for food allergies? It’s up to you as the parent to do the research on this for your child’s issues, but here is my opinion. If your child has autism, it is very likely they have food allergies. Like VERY likely. It’s not that food allergies cause autism, but it’s more of a by-product of sorts because almost all kids with autism have dysfunctional immune systems which lead to allergies. If you have a child who has seizures, I would suggest food allergy testing. 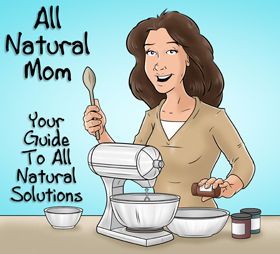 My son came up as highly allergic to peanuts (at 18 months old), and lowly allergic to gluten, dairy, and eggs. 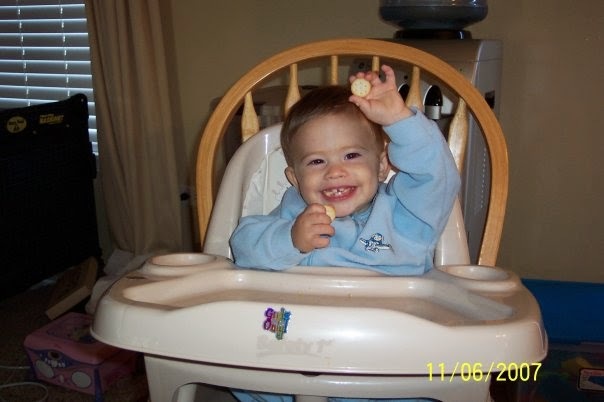 Even though he came up lowly allergic to eggs, gluten, and dairy, I still pulled them because I had read of so many people who had put their kids on GFCF for seizures, and their seizures stopped. I pulled eggs because my daughter was highly allergic to them. I discovered when I tried to give them to him, he got severe diarrhea and seizures at night. I’ve never tested peanuts. 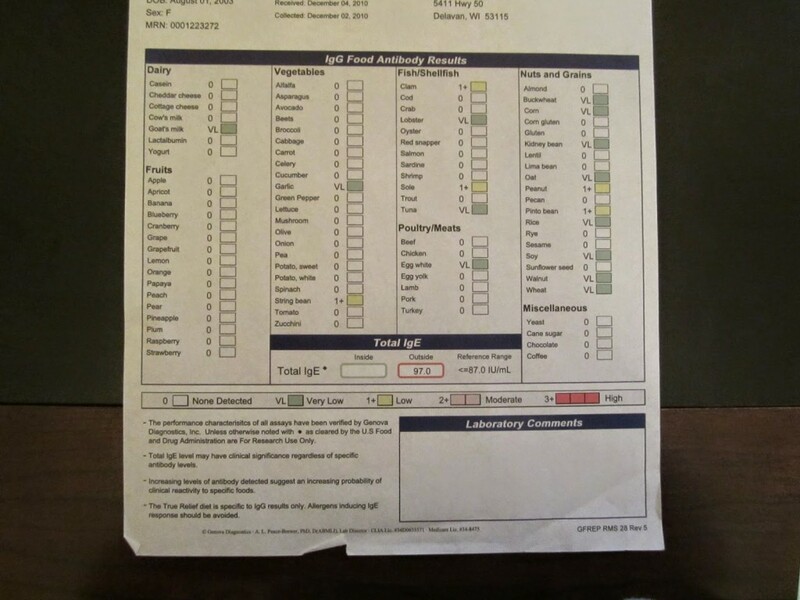 He also may not have come up as highly allergic to gluten and dairy because I had already had him on the GFCF diet for 3 months when we had testing done. Some classic signs of allergy are diarrhea, headaches, dark circles or bags under the eyes, stomach aches, sometimes constipation (especially from gluten), etc. Gluten and dairy are tricky. It’s quite common to come up as not highly allergic to these two, and yet have a lot of issues when eating them. I did not come up as highly allergic to either (low though), and I get migraines every time I eat dairy, and majorly bloated stomach, dark circles under the eyes, and stomach aches from gluten. If you are testing for gluten and you want a real result, your child would have to eat gluten for about 4 days prior to the testing to show an “accurate” result. If they are already GFCF, I would not suggest giving them gluten for 4 days for the test. It’s hard to start GFCF, but once you are on it, and you go quickly back to gluten and dairy, it would cause too much hardship on the child, in my opinion. I say this because I have done it myself. It makes it hard to go back on GFCF. They will go through withdrawal all over. Since the results for gluten and dairy specifically aren’t all that conclusive anyway, I don’t think it’s worth it, and most DAN doctors will tell you the same. If you haven’t yet started GFCF, good time to test, however, I wouldn’t hold off long to start GFCF if you know you want to start and are just waiting to get testing done. After you’ve had your testing done, it takes about 2 weeks to get the results, sometimes 3. They will send the results to your doctor first and they will then mail them to you. If you’re impatient like me, you can call the lab and find out when they were mailed to your doctor, then call your doctor and ask them to tell you any high results or fax it to you as well as mail them. Your doctor may go over the results with you. My DAN doctor had a nutritionist that went over the results with me and explained them b/c I didn’t know what they meant. It’s not too difficult to understand. With Genova, they sent the results with a reading of either 0,1,2, or 3. If there was a zero, they were not allergic to that food. A one means they are lowly allergic to the food, and ideally you will want to rotate that food (once every 4 days). A two means they are moderately allergic. If this shows up for peanuts, avoid them all together. Sometimes with eggs too. Below is a picture of my daughter’s test results from Genova. The first picture is the first one we did in 2008. The second one is the one we did in 2010, two and a half years later. She clearly had an allergy to eggs and cabbage (which was used to color the natural suckers she was eating). I had no idea. She had no clear symptoms of being allergic to eggs but she did have learning disabilities and some other issues. We have reintroduced eggs now since her second test. I don’t cook with eggs since my son reacts to them, but she eats omelets about twice a week. I’d like to have her retested again soon to see if her egg allergy has changed. My son showed up with a 1 to eggs, but he gets major diarrhea from eggs so we just avoid them. Eggs and peanuts tend to cause the most severe reactions in people. If you have a 2, you should likely avoid them, but you can remove them for a few months, then try test them one at a time (and at least four days apart from any other food you are testing) for a reaction. We didn’t have many 2’s, so I’m not familiar with how 2’s affect kids. Ours was for peanuts, so we just avoid them completely. 3 means they are highly allergic. If you have a 3 on an IGG test and you also have an allergic response on an IGE test, chances are you will have to avoid that one for a long time and possibly indefinitely. My daughter had a 3 to eggs on the IGG and a 1 to eggs on the IGE. Even though the IGE is low, since she has a high IGG number, we will probably have to avoid them for a long time because it is a “true” allergy, and not just a sensitivity. Avoid all foods that come up as a 3. Hopefully, your child will not have too many 3’s. You can work with 1’s even if they have a lot. My daughter had a total of 32 reactive foods on the IGG, however, most were 1’s, a few 2’s, and a couple 3’s. Sometimes you get lucky and the 2’s and 3’s are things they don’t even eat. For my oldest son, he showed up allergic to a bunch of fish. Lucky for him, he doesn’t like fish. But interestingly, my mom used to feed him fish all the time from the time he was about 10 months old till he was about 2, when she used to babysit him. I have heard it said even by my regular pediatrician, that they believe that some allergies are caused by feeding babies food too early. Back in the 70’s, they suggested feeding babies cereal as early as a few weeks old to hungry babies. In 2000, they were telling us between 3-6 months, you could start cereal and baby food. I always held off till 6 months to even start with all of my kids. By 2007, the advise from doctors was to wait until 6 months because of the drastic rise in food allergies. While I don’t think the rise in allergies is solely from feeding babies food too early, I think it contributes to the problem. Breastfeeding of course is best, and kids that were breastfed tend to have fewer allergies. Maybe that has some to do with the fact that formula contains so much garbage. If you look at the ingredients on the can, most have corn syrup as a major ingredient. Carnation Good Start contained 40 % corn syrup solids. Yuck. That’s what I used. No wonder my son can’t handle corn syrup. Other formulas contain dangerously high amounts of soy. Soy is one of the top eight allergens. Soy also is a hormone disruptor. Girl babies that were on a soy based formula, tend to hit puberty much earlier than normal. There are 9-year old girls going through puberty these days, which is not normal. Older women who drink soy milk tend to go through menopause at a much earlier age as well. Anyways, back to allergies. Most people will have allergy testing done again after a year to see if there are any changes. It is possible for your child to develop new allergies over time, and to lose some allergies, especially if they have been avoided for a time. True allergies will tend to stay the same. If you have to avoid potatoes, and you suddenly start feeding your child a lot more rice and rice products, they can develop a rice allergy. That is why doctors and nutritionists will recommend trying to keep a varied diet and rotating as many foods as possible. If you have to avoid a lot of foods, this can be hard. I have not retested my daughter yet, but plan to in the near future. I suspect my youngest son may have a new allergy to rice. He gets very aggressive from rice milk, and every time he has rice milk, he wakes up in the middle of the night and likes to lay on his stomach with his legs hanging off the side of the bed. This is a sign that their stomach hurts. Rice also feeds yeast and bacteria, so that could be another reason. Update: I now attribute his reaction to the rice milk to the carrageenan in it. My youngest now (4) will get a stomachache if she eats dairy free ice cream with carrageenan in it. The most accurate way to test for allergies is through observation. Keep a diet diary and see what your kids react to. There’s no way I would have been able to see all 32 foods that my daughter reacted to, and it is hard when they are eating a variety of different foods every day, but sometimes there is a very distinct reaction to certain foods. Ie. Rash on the face, hives, throwing up, diarrhea, etc. You can then test the foods that you believe they are allergic to, and then avoid those foods. If you use Alletess, their test results are a little bit different. They show you the actual number instead of rounding to 1, 2, or 3. I used Alletess. It’s kind of nice because you can see how close they are to a 1, 2, or 3. For example, if something came up as 2.48, Genova would have rounded it to a 2, so it would be good to know that it was close to 2.5, or if it was 2.52, it would have been rounded to3, etc. They will also include a long explanation about food families and rotation diets. 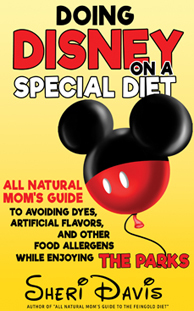 I didn’t really read it but it basically told you which foods are in the same family. 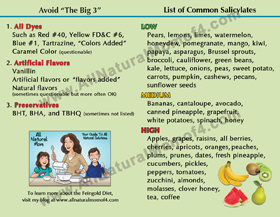 So, if you were highly allergic to cabbage, you would want to know what other foods are in the same family, because you might want to rotate or avoid those foods as well. What is cross contamination (CC)? Cross contamination is a term you might come across on message boards. It means that a product was made on the same line in the same factory as a food that you are allergic to. The box might say “May contain traces of peanuts”, or “Made on the same line as milk and eggs.” If your child is very sensitive, you will have to avoid these products as well. They do clean the lines in between runs, but there is always a trace amount left on the machine that they cannot get completely off. If you buy from allergy food companies like Miss Roben’s or Enjoy Life, their box will say, “Made in a dedicated facility that is free from all possible allergens”, etc. We typically avoid products with CC because we usually react to them. Products made from large chains like Trader Joe’s and Whole Foods brands, will have CC issues because all of their products are made in the same facility and with gluten especially, flour goes flying everywhere and can get into other products, or products are not run on dedicated lines (meaning they’ll make a gluten free product, clean the machines, then run another regular product in between. Usually they will tell you on the packaging if it was run on machines with one of the top eight allergens, but not always. I have seen salad and baby carrots from Trader Joe’s that say they were run on the same machines as milk products. FYI: The government has mandated that if a food product contains one of the top eight allergens, it must be listed on the label. The ones that I know are included in that are milk, eggs, wheat, and soy. I don’t know the other ones. However, I would never rely on that if you have allergies, but if you do see it listed, you know it contains those allergens. Also, a product can be advertised as “dairy free”, but not actually be free of casein. This is common in probiotics. 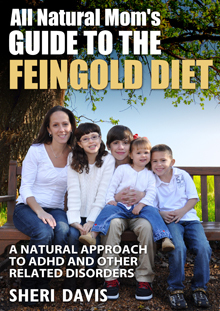 For an insider’s view on the Feingold Diet, check out my new book, “All Natural Mom’s Guide to the Feingold Diet – A Natural Approach to ADHD” available now on Amazon! Posted in Biomed and tagged Allergy Testing. I am confused, when I go to the alletess site, it just shows listings for other webpages/companies. What company did you actually buy your allergy test from? Sorry, I must've googled it when I went to it before. Their actual web address is http://www.foodallergy.com. Thanks for letting me know. Thanks, this site looks much better. What a great deal!! Thank you so much for writing this post at the perfect time! We just did the Genova test, but a good friend of mine needs to do it for her daughter and has an HMO that won't cover it. This test just might be possible for her now. THANK YOU!! Thanks for all the information you are posting. We just ordered the kit, but it's not quite as easy as I thought to get this done. We called the allergy testing place and found out that our doctor has to set up an account with them first. We also wanted to find out about pricing of the different lab tests and they said we had to get that information from our doctor. Fortunately, our sons doctor is a co-worker of my husbands and he set up the account with the lab and will let us take a look at the prices. 🙂 we are curious to see what the test will show. We have had some success with Feingold, but need to pinpoint some more triggers for our son. Thank you so much for this info!! The Feingold diet is a little overwhelming and I'd love to see if/what her sensitivites are. This blog has been soooo incredibly helpful to me! I was a bit skeptical when I couldn't find the pricing on their site. Did a google search & found your blog. Was the price around the same in 2016?